Planning your next sunny escapade? Here’s all you need to plan a fantastic one week holiday to the Dominican Republic, away from the beaten path and the all-inclusive resorts. The article includes where to go, where to stay and how to get around! For far too long, a Dominican Republic holiday was pretty much synonym with sun, beach, and all-inclusive resorts. Now, don’t get me wrong – there’s plenty of all that to be found in the country, but if you spent your time in the Dominican Republic between the pool and the beach of your resort, you’d be missing out. The Dominican Republic (often referred to as DR or Dom Rep for short) occupies the eastern part of the island of Hispaniola, the second largest in the Caribbean after Cuba. The western part of the island is under the sovereignty of Haiti. Hispaniola was one of the islands where Christopher Columbus landed during his first voyage to the Americas, and Santo Domingo – now the capital of the DR – was the first colony to be established, and the longest continuously inhabited city in the New World. 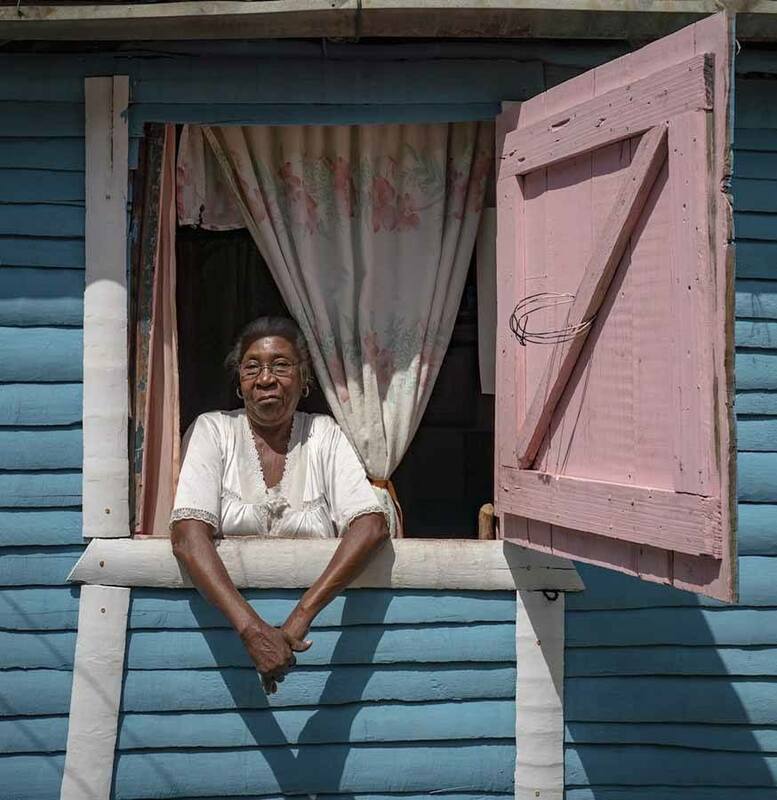 History lovers will enjoy exploring the Dominican Republic. It is a true ‘country of firsts’ – besides being home to the first colonial settlement, it also houses the first hospital, the first cathedral and the first university in the Americas. 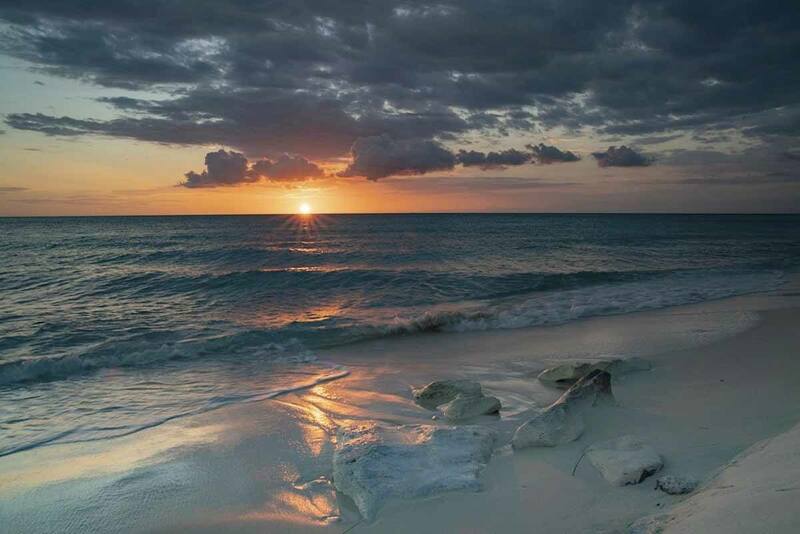 The DR is also a great destination for nature lovers. 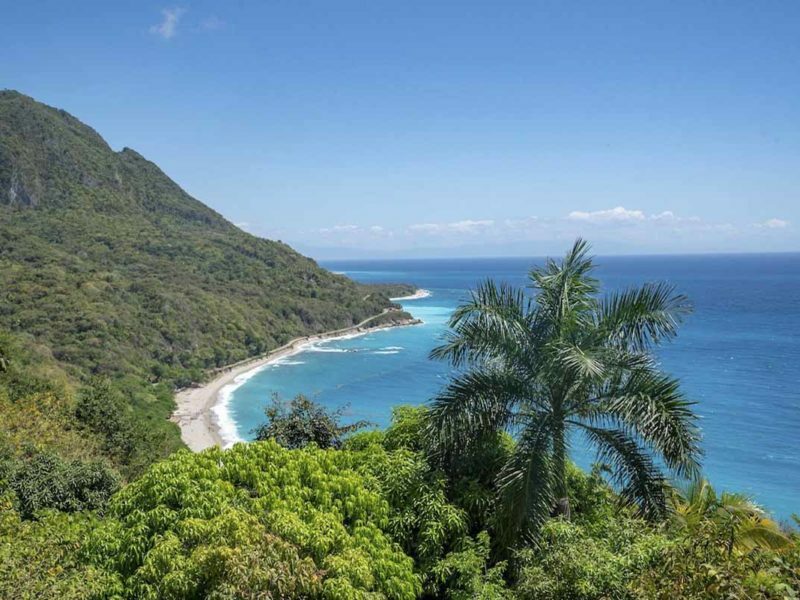 You can hike to the tallest waterfall and climb the highest mountain in the Caribbean, go whale watching, enjoy windsurfing and kite surfing along the northern coast, swim in remote lagoons and even cenotes – and yes, you can also spend time on pristine, paradise beaches, sometimes with no one else in sight. Yes, in the Dominican Republic you’re never too far from the beach! This week-long Dominican Republic itinerary focuses on the central and western part of the country, including sights and locations away from the all-inclusive resorts of touristy La Romana and Punta Cana. The itinerary starts and finishes in Santo Domingo, from where the country’s main international airport is only a short drive away. Let’s have a look at some practical information about the Dominican Republic before moving on to our one-week itinerary. Most visitors will be reaching the Dominican Republic by plane. The country’s two main airports are Punta Cana International (PUJ) in the east of the country, and Las Americas International Airport (SDQ), about 40 minutes from Santo Domingo. Many charter airlines fly to Punta Cana, and you maybe able to find some great deals. Las Americas can be reached regular scheduled flights from all over Europe, the Caribbean and North America. I flew with Iberia via Madrid, a comfortable 8-hour flight, but there are lots more airlines to choose from, depending on where you’re travelling from. If you wish to follow this one-week Dominican Republic itinerary, we highly recommend flying to Las Americas and making your way to Santo Domingo from there. The easiest way to reach Santo Domingo is pre-booking a transfer with your hotel, which should cost about US$35 one way. A cheaper alternative is Uber, which will cost you about RD$700/800, about US$13-15. The Dominican Republic has good roads, and affordable prices for car rental – if booking in advance, you may be able to pay as little as $150 for a week. There are many international car rental companies at Las Americas international airport, so at first glance, it sounds like a great way to get around the Dominican Republic. Yet, there is a but. Dominican drivers are CRAZY. Speeding is commonplace, traffic lights and stop signs are more suggestions than rules, and most traffic laws (and even laws of common sense) do not apply. We highly recommend against driving in the DR, unless you’re an excellent driver with very quick reflexes. Even if that is the case, please don’t drive at night. This is the transport of choice for locals travelling around the country and super budget backpackers. Guaguas (pronounced wa-was) are minibuses, similar to the taxi brousses we used to travel around Madagascar. In theory, they sit approximately 20 people, but in practice, they are often packed to double that capacity. Guaguas are by far the cheapest way to travel around the DR – to give you an idea, an hour-long ride (for example, from Santo Domingo to the airport, or from Cabarete to Puerto Plata) should only cost approximately RD$50-70 (just over 1 dollar). You can easily catch guaguas off the street in most major cities and beach resorts. Just make sure you double check the price with the driver before boarding, or else you may be charged double or even triple the correct fare. The Dominican Republic also has a good network of comfortable, air-conditioned long-distance buses. The main bus companies are Metro and Caribe Tours, and between them they share connections between towns and beach resorts around the country. Metro is slightly more luxurious than Caribe Tours, but both are a good option. If you don’t want to drive or get a private driver, you can easily get around the DR with a combo of buses and guaguas, with some taxis or private transfers thrown in if you’re planning to reach remote locations. Hiring a private driver is the easiest way travel around the Dominican Republic. A driver will cost between $150 and $400 per day, depending on itinerary and number of people. It’s not a cheap option and probably best for a group of at least 4-5 people, but you’ll have the convenience of your own vehicle, without having to worry about crazy Dominican driving. In some cases, having a private driver is actually the only way to reach certain points of interest. An example is Bahia de las Aguilas, a remote beach near the Haitian border. The kind of weather you’ll find in the Dom Rep in March! I visited the country in late March, and it was actually a great time to visit the Dominican Republic – the weather was warm, but not excessively hot (around 25-27°C), and it never rained besides a quick 5 minute shower. The weather in the Dom Rep is consistently warm and sunny year round. The rainy season takes place between May and October, with hurricanes sometimes hitting in August/September. However, don’t forget that in the Caribbean ‘rainy season’ doesn’t mean it rains 24/7 – it usually rains just for a few hours, and it many not rain at all. 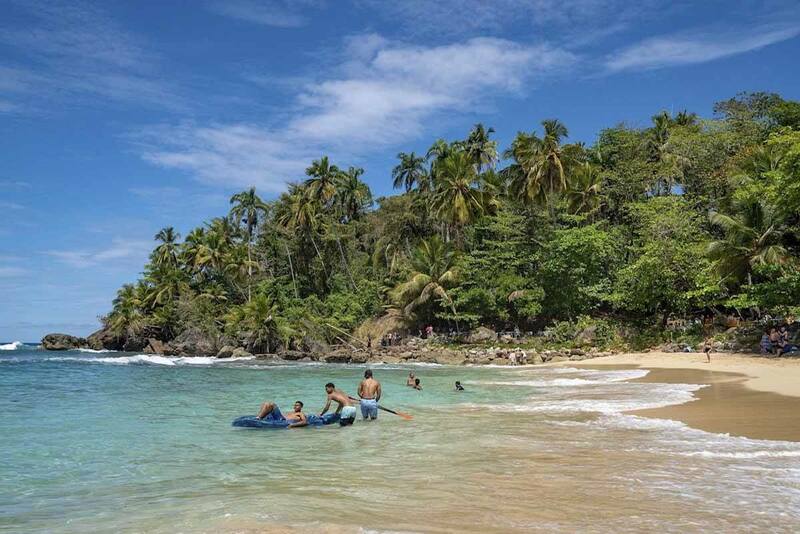 Between December and April the weather is dry and sunny, but this is also when the country is at its busiest with North American tourists visiting for Christmas and Spring Break, as well as many expats returning to the DR to visit their families. If you want to escape the crowds without having to deal with excessive rain, the months of April and November are good options. 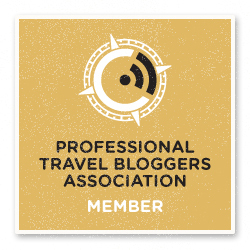 This week-long itinerary around the Dominican Republic starts in Santo Domingo, the country’s capital, and the largest city in the Caribbean with approximately 4 million inhabitants. 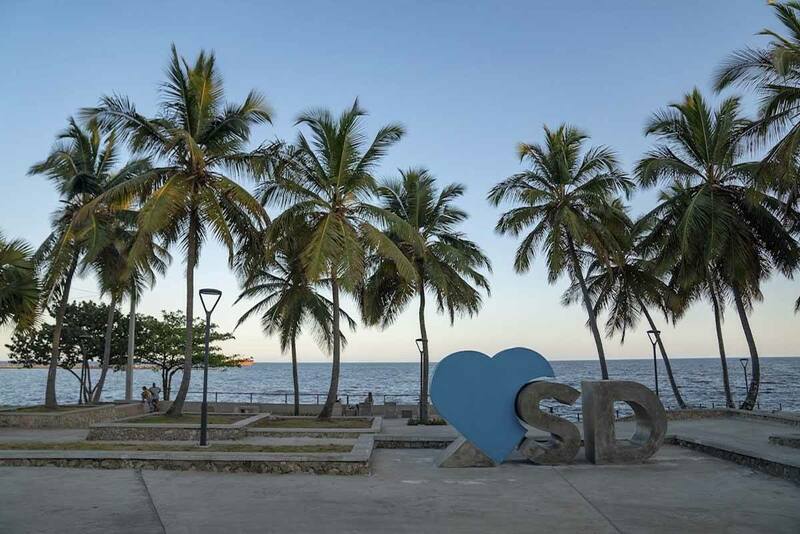 With one day in Santo Domingo, I recommend dedicating your day to two main points of interest in the city, the Zona Colonial and the Malecon. The UNESCO-listed Zona Colonial is Santo Domingo’s historic centre, where you’ll find all those ‘firsts’ dating back to the 16th century, when the town was the capital of all Spanish settlements in the New World. Don’t miss checking out the Cathedral of Santa Maria la Menor, the first cathedral in the Americas and a curious mix of Gothic, Baroque and Renaissance styles. The cathedral was built between 1504 and 1541 in golden limestone, and inside you can visit the beautiful treasury with sacred paintings, statues, silver, jewellery and woodcarvings on display. After visiting the cathedral, it’s nice to spend some time in nearby Parque Colon, a shady square filled with trees, giving it the feel of a Mexican zocalo. It’s a great place for an evening drink to soak up the atmosphere, with street musicians often playing local tunes. Just around the corner you’ll find Calle El Conde, the longest pedestrian street in the Caribbean. It’s touristy for sure, with souvenir shops and pavement cafés, but there are also some cool places beloved by locals like La Cafetera, a café open since the 1930s. Two other ‘firsts’ you can check out in the Zona Colonial are the Hospital St. Nicolas de Bari, the first hospital in the Americas, and the Monasterio de San Francisco, both now in ruins. 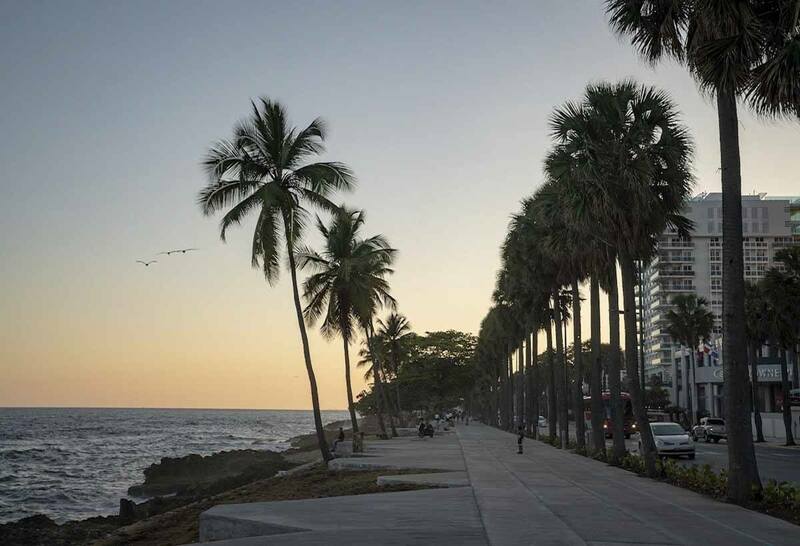 A few blocks south you’ll find the Malecon, Santo Domingo’s seafront boulevard. Its official name is Avenida George Washington and it’s a whopping 14 km from one side to the other, making it perfect for a sunset walk or run. 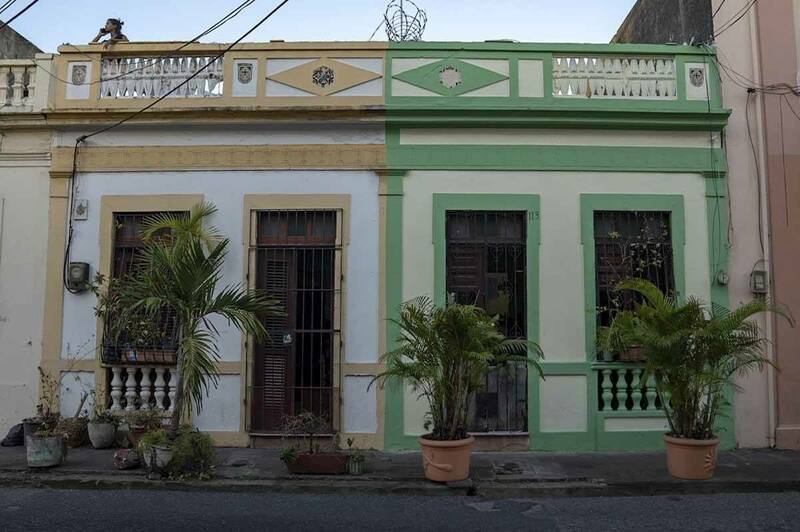 Where to stay in Santo Domingo – Casa Sanchez, a boutique hotel in the heart of the Zona Colonial, only a few minutes walk from Calle El Conde. The rooms are named after historical characters and are all individually decorated – for something truly unique, opt for the Britannia or the Hermanas Mirabal Suite! Hodelpa Nicolas de Ovando – a stunning luxury hotel in a colonial building. Hotel Billini – another luxury option, with a more modern vibe. Have a look at some interesting tours of Santo Domingo and surrounds! 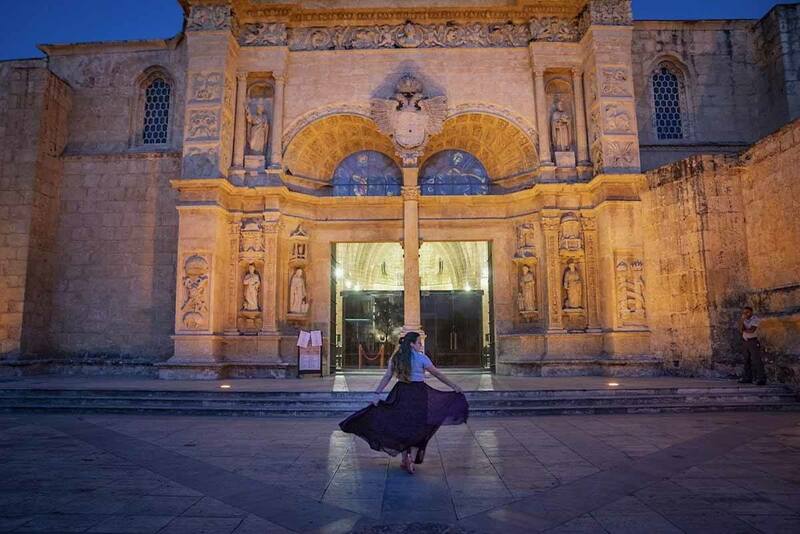 If you want to see a side of Santo Domingo that most visitors don’t get to experience, we recommend dedicating the second day of your Dominican Republic itinerary to the surrounds of the capital city. We took a day long tour with a local operator, starting with an e-bike tour around El Higuero, a rural area just north of the capital. We rode for a few hours along quiet roads, past Santo Domingo’s domestic airport, crossing brightly-painted villages and even stopping at a river for a refreshing dip. 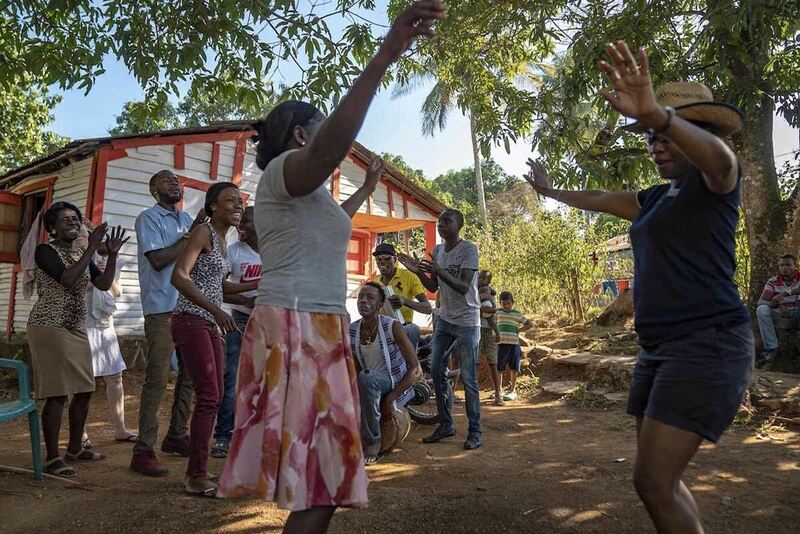 After a home-cooked lunch with a local family we moved on to Los Morenos, a community inhabited by people of African heritage, descendants of slaves brought to the country during colonial rule. Music and dancing at Los Morenos! Their culture is influenced by African, European, and Taino heritage, the indigenous Amerindian population living in Hispaniola before the arrival of the Spaniards. We visited a local shaman, who showed his altars and told us about the concept of misterios, a presence that accompanies people throughout their life. 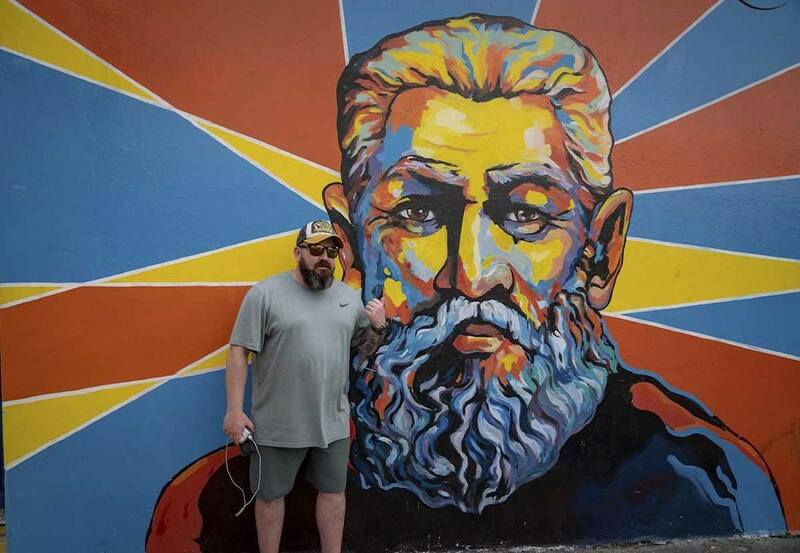 Sean @byrnephotography and the street art guy have matching beards! Leaving Santo Domingo and heading north, after a couple of hours you’ll reach Santiago de los Caballeros (Santiago for short), the second largest city in the Dominican Republic and fourth largest in the Caribbean. Santiago is in the heart of the Cibao Valley, one of the most fertile areas in the country, especially known for its tobacco and sugarcane plantations. Make sure you don’t miss visiting the Aurora cigar factory, the largest in the Dominican Republic. A section of the factory has been set up for tours, and visitors are shown the stages of cigar production, from tobacco leaf to finished product – and you may even be offered to sample a cigar. Santiago is also a great destination for street art lovers. A few years ago, the city municipality commissioned artists to decorate building façades in the city centre, to beautify the city and provide some much-needed splashes of colour in a city that otherwise would look a bit grey and drab. Some of the best murals can be found around Calle Cuba and Calle 16 Agosto. As far as I know, there are no street art tours available, so I can’t really share info about the meaning of the various pieces, but it’s till fun to go out and take pictures. 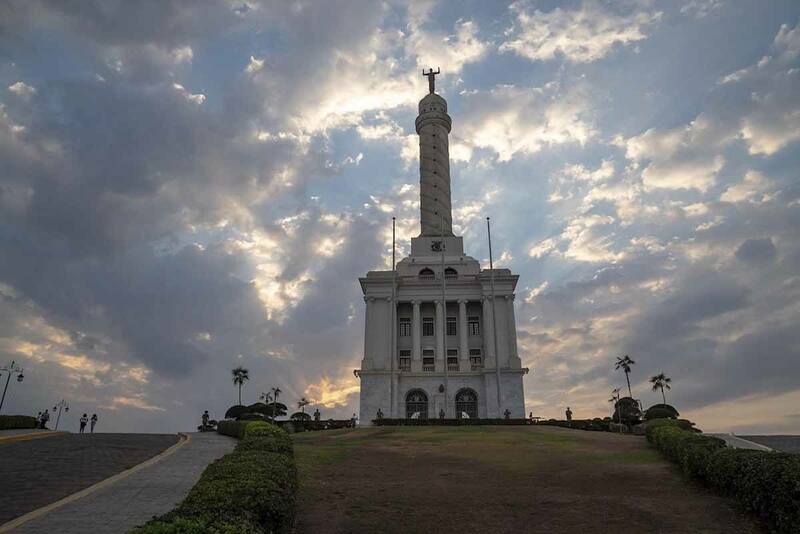 The best-known landmark in Santiago is the Monumento a los Héroes de la Restauración, originally built to celebrate the DR’s independence from Haiti and located on a hill overlooking town. 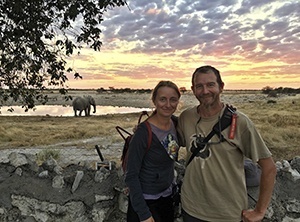 It’s a nice sunset spot – after you can choose to have dinner at nearby Square One, a funky restaurant in a petrol station. You’ll find restaurants and bars in petrol stations all over the country, so make sure to stop at least once during your journey in the Dominican Republic! Where to stay in Santiago – Hodelpa Centro Plaza in the city centre, a well-priced luxury hotel with a gym, rooftop restaurant and even a casino! The centre of the Dominican Republic is covered in mountains, and even short trips like the 50 km between Santiago to Jamao del Norte, an offbeat mountain town in neighbouring Espaillat province, might end up taking hours. Even though it may look tempting to head straight to Cabarete from Santiago, we highly recommend adding a stop in Jamao del Norte to your Dominican Republic itinerary – especially if you love kayaking! We spent half a day kayaking along the Yasica river, which was probably the most pristine river I’ve ever seen. The river is in a very remote area, surrounded by terraced, palm-covered mountains, and the water is so clear you can easily see long, silvery fish zip through the rocks. From Jamao del Norte, Cabarete is about a 45 minute drive away. This beach resort is a popular kite surfing destination, with a long sandy beach where wind blows year round – except when we visited. When the sun goes down, the entire beach becomes full of bars and restaurants, so if you want to add a ‘party night’ to your week in the Dominican Republic, Cabarete is a good option! The area surrounding Cabarete is full of interesting natural sights, and spending a day checking them all out is a great way to escape the buzzing beach scene. Alternatively, if you’re heading south to Samanà or Santo Domingo, you can visit most of these places along the way. As your first stop, we recommend Laguna Gri-Gri, a lagoon that appeared near a mangrove forest in the 1960s, after an earthquake. A local boatmen cooperative runs boat tours, taking you down a short canal surrounded by mangroves, to the coast where you’ll visit some cliffs and sea caves before making a stop at a secluded beach. Don’t miss trying the piña colada served in a pineapple! After this stop, the day will just keep getting better. You can stop at Playa Grande for lunch, order fish at one of the small wooden huts and then ask them to set up a table for you in a comfortable spot in the shade. While you wait for your fish to be cooked, it’s the perfect time for a swim! Playa Grande was one of my favourite places in this Dominican Republic itinerary – the food was delicious, the beach was beautiful, and full of local families having fun. Before continuing the long drive south there’s one more stop – Laguna Dudu, which is actually a cenote! That’s right, cenotes are not just found in Mexico, but also in the Dominican Republic. You can dive into the cenote from a 13 meter zip line, or just float into the two smaller cave pools located in the same complex. From Laguna Dudu it’s another 2 hours back to Santo Domingo. 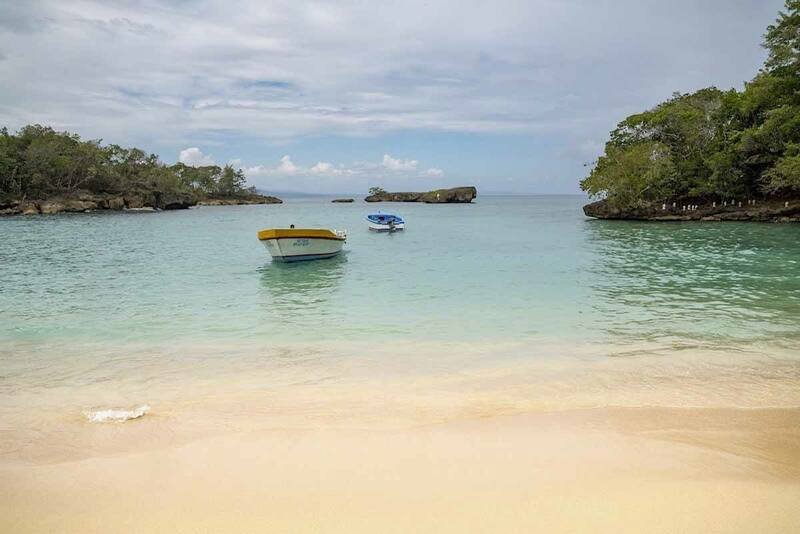 The capital would just be an overnight stop this time, as it’s the easiest place to stop en route to Bahia de las Aguilas, the highlight of this Dominican Republic itinerary. Otherwise, if you can add 3 days to your journey and turn this into a 10 days Dominican Republic itinerary, we recommend stopping at Samana peninsula, one of the best whale watching locations in the Caribbean! Here are some more awesome tours in the vicinity of Cabarete! Yes, the water at Bahia de las Aguilas is THAT AMAZING! Lovers of secluded spots, remote beaches and oceans with one thousand shades of blue – this one is for you! Bahia de las Aguilas is a beach in the far west of the country, not far from the border with Haiti. 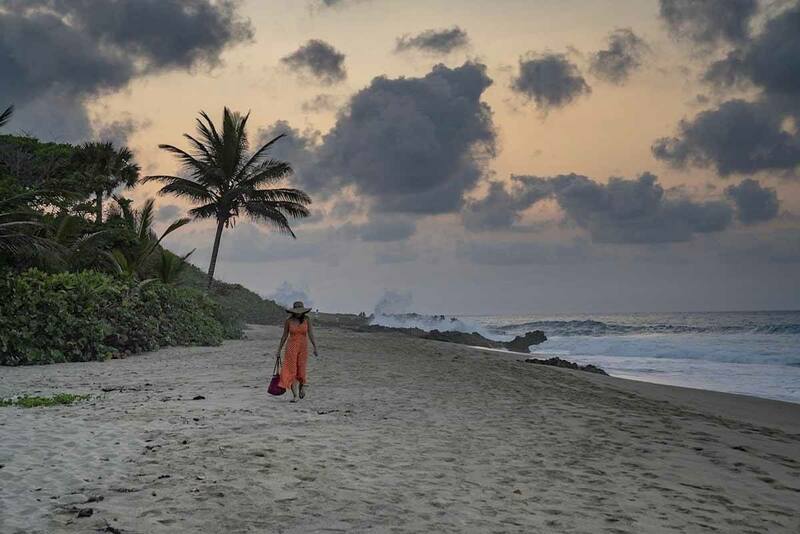 The beach is at the end of a twisty, potholed road about 6 hours from Santo Domingo, and it’s virtually undiscovered by international tourists. You’ll find a few locals, but that’s it. There are no resorts in Bahia de las Aguilas, only two eco-friendly glamping resorts. You can enjoy the beach opposite the two resorts, or ask to be taken by boat about 15 minutes away through some rocky outcrops to a beach that is just pure paradise, a 7 km half-moon of powdery white sand, surrounded by the clearest turquoise water I’ve ever seen. 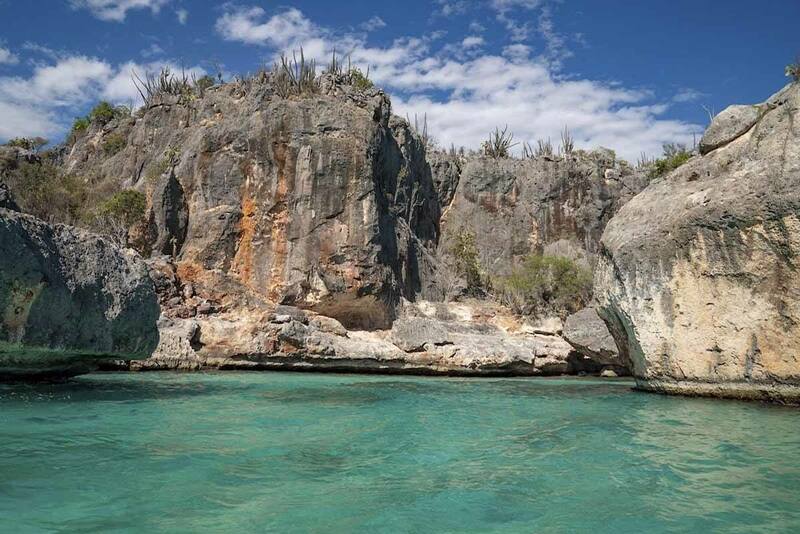 Bahia de las Aguilas is the kind of place where you can just escape from the world and be surrounded by nature. Wi-Fi and phone reception are spotty, but who cares when you’ve got this? If you can turn this week-long Dominican Republic itinerary into 10 days, we highly recommend spending at least three days at Bahia de las Aguilas. You won’t regret it! Where to stay at Bahia de las Aguilas – Eco del Mar, a beachside eco glamping resort with luxury decked tents. Rancho Tipico Cueva de las Aguilas – located right next door, a more affordable (but still eco-minded) option with spacious tents right on the beach and a seafood restaurant just next door. From Bahia de las Aguilas, it’s a long drive back to Santo Domingo. We recommend taking it easy, enjoying one last morning dip at Bahia de las Aguilas before saying goodbye to paradise. There are also a couple of points of interest to check out along the way to Santo Domingo. One of them is Laguna de Oviedo, a saltwater coastal lake and one of the best bird watching locations in the Dominican Republic, with flamingos, herons, pelicans, spoonbills and more. Make sure you close your eyes if you dive in, as the salt content in its waters is three times higher than the ocean! Another cool place to see is Los Patos, which some claim is the shortest river in the world at only 61 meters. You can swim where the river meets the sea and have lunch before resuming your journey back to the capital. Finally, don’t miss stopping at the lookout over Playa san Rafael, a stretch of coast so beautiful it has been featured on many Dom Rep tourism posters and brochures. There’s also a nearby town called Paraiso, meaning heaven in Spanish. Can you imagine a better place to round up your week-long itinerary around the Dominican Republic? Many thanks to Esther and Carlitos from the Dominican Republic Tourism Board for having invited me to spend a week discovering the country!